Effective January 1, 2020, The USGA Handicap System as we know it will become The World Handicap System. No matter where we travel, the same handicap rules apply. All golf clubs will still be required to attend a handicap certification class and pass the required test. Classes will begin late in 2019. Information will be sent to all named handicap chairs and club officials, so please keep your club up to date with this information. While details are being finalized, all clubs will be required to successfully complete a certification class regarding the WHS regardless of when they last attended. When and how these classes will be given will be sent out later this year after the USGA has determined a timeline and requirements. 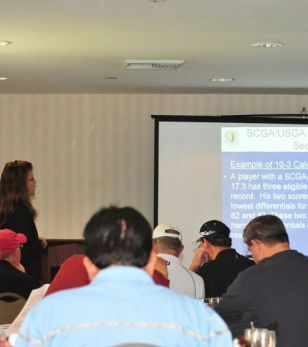 If you wish to test your knowledge of the current USGA Handicap System, you may do so online. Keep in mind this DOES NOT mean you will be exempt from attending and passing the World Handicap System certification class.